There are few things better than walking into your home after a long day at work and being met with a blast of wonderfully cool air. No matter how tough your day might have been, getting out of the heat and relaxing in your air conditioned home with your family will quickly turn a bad day into a good one. Conversely, if you’re already hot and you come home to a house with no air conditioning, your day probably isn’t going to get a lot better. At Blueox Energy in Oxford, we have been helping our communities stay comfortable in their homes all year long for decades. Whether you need a new air conditioner in the summer or a furnace in the fall, we are here to help. Our HVAC technicians are highly skilled and can install and fix almost any air conditioner around. Read on to learn more about our heating and cooling services and repairs, or call Blueox Energy today to find out how we can make your house a joy to be in! Some of the best and most efficient air conditioning units around are RUUD units that can be installed by our trusted technicians. These units are more reliable, quieter, and can cool your whole home for less money. If you’re thinking of upgrading your current AC unit, or installing a new whole-home air conditioning system, think RUUD. To learn a little more about what you can expect, download more information HERE. Air conditioners can run the gamut from large outdoor units (central air, swamp coolers) to small, ductless air conditioners that can be installed in single rooms or throughout a house. Because of the great number of variables out there, it can be difficult to find someone to repair your AC unit. Luckily, at Blueox Energy, our technicians have been working in the industry for years and have experience working on many different kinds of air conditioners. Not only can this save you from having to buy a new unit, it also means that our techs can let you know what things to watch out for. Our AC services are a great way to make sure that your air conditioner is ready for the upcoming warm seasons. Call us today to schedule a service before it gets too hot out! Our techs will come to your home or business, inspect the unit, make sure it is working, and perform routine maintenance. If there is something wrong with the unit, they can fix it or order parts so that it will be ready for when the heat really kicks in! If you own an older home or you have recently completed an addition or a remodel, it may be time to reevaluate your cooling and heating needs. Changing the size of your home can mean that your current unit won’t be able to adequately cool your home. Our sales staff can show you what your options for efficient and affordable air conditioners are, including the top-of-the-line ductless cooling systems that we sell. Get in touch with Blueox Energy today to speak to an energy, heating, and cooling expert. We will do everything we can to ensure that your home or business maintains a comfortable temperature all year round! Call us now to set up your AC service in order to avoid the rush! You can also learn more about our energy efficient RUUD whole home AC Units. Is Ductless Cooling Right for My Home? Whether you are remodeling your home, adding a room, or you are looking for a more efficient way to cool your home when it starts getting hot outside, there are so many choices out there that it can be difficult to decide which option is right for you. Over the last few years, ductless cooling and heating units have become more and more popular, and for good reason. In this blog, we will discuss the benefits of ductless air conditioning systems and when they might be the right choice for your home! At Blueox Energy is Oxford, our business is devoted to helping people find the best heaters and air conditioners that are available, while also providing world class HVAC services and fuel products. When you need kerosene, home heating oil, a new furnace, or AC service, contact us at Blueox Energy today. Ductless air conditioners are just like other kinds of air conditioners, except they are much smaller and do not require special ductwork in order to generate and move cool air. A ductless AC unit is usually made up of two parts: indoor units and an outdoor unit called a compressor. The outdoor unit cools the air and sends it inside using thin pieces of pipe. The indoor unit cools the room just like any other air conditioner, with several important differences. First, they can be installed much more quickly than a central air system. Second, ductless air conditioners are generally used for only one room. These differences are important, as you’ll see in a second. Ductless AC units are a great choice for many different situations. If you have an older home that does not have ductwork, a ductless system is an easy way to enjoy cool comfortable air without having to tear your house apart. If you have remodeled, expanded, or added a room to your home, ductless units are a great idea. Expanding your home in any way will force your central air system to work harder to try to keep the new, larger area at the temperature you set. If your central air unit had BTUs to spare, this may not be a problem, but most homes have units that are designed to cool the size of the home, and nothing larger. While you might think that this would only affect the room(s) you have changed, the truth is worse: your entire home will be less cool. When you only need a few rooms cooled, ductless air conditioners might be perfect for your home or business. If the downstairs in your home is usually at a comfortable temperature but the rooms upstairs need AC, ductless options are perfect for solving that problem. If you do a lot of work in your garage but find that it gets too hot, adding a ductless air conditioner will make the space usable day or night! Contact us at Blueox Energy in Oxford today if you have questions about ductless cooling. Our staff would love to discuss how to make your home more comfortable during spring and summer with a new air conditioner! We also have a wide range of heaters and furnaces, so you can get ready for the cold. At Blueox, we are dedicated to helping all of our customers live more comfortably. Give us a call today for heating and cooling system repairs, installations, and sales, or for great prices on home heating oil and kerosene. We have been in business for decades because we always take care of our customers. Let us take care of you, too! While it is nice to think that we could run into our homes at any moment and enjoy a blast of cool air, the truth is that we don’t always need to have our AC running at full strength all the time. If you want to keep your home comfortable during the hours when it matters most — afternoons, nights, and early mornings — but you also want to save money on cooling costs, there is a simple solution. A thermostat with a clock or timer will make your home comfortable for the times you are there and more energy efficient when you aren’t there, and with a little trial and error, you will be cool and comfortable and save a few bucks. Your home can handle warmer temperatures than you can, so setting your thermostat to a warmer temperature when you won’t be in the house will help keep your bills lower. You don’t want to shut your air conditioner all the way off during the day or overnight because it will have to work that much harder to cool off the air when you turn it back on. This isn’t due just to rising temperatures, though. When you turn your AC off, the air will grow more humid. Humid air tends to feel warmer and heavier. Part of your air conditioner’s job is to dehumidify the air because it makes it feel cooler. If the system has to dehumidify the air every morning or before you get home in the afternoon, your energy consumption may skyrocket. Close the blinds. Keeping the sun from shining directly through your windows will keep your temperatures down. While shades help, if you really want to prevent any solar heating, use heavy, dark curtains. Curtains will also help prevent temperature loss if you have older windows. Close the doors to rooms you aren’t using. If you aren’t using an extra room, shut the door. Closing off unused spaces will help the cool air stay centralized in the parts of your house where you spend your time. Use your ceiling fans. Set your fans to run counter-clockwise during the summer to pull warm air up while pushing cool air down. Eat cold food and drink cold drinks. Turning on your oven in the summer is a bad idea if you’re trying to keep your home cool. Snack on cold fruits, veggies, meats, and cheese for a filling, tasty meal that won’t raise your indoor temperature, and finish it off with your favorite cold beverage. Stay hydrated. Drinking enough water isn’t just good for you, it can make you feel less warm, too! Sweating reduces your hydration level, so if you want to stay cooler for longer, keep drinking water. A glass of water before you go to sleep at night can help you cool down and get to sleep faster. Change your sheets. If you have a big, warm comforter and flannel sheets for the winter, make sure to change them out for lighter linen sheets and a thinner blanket once the temperatures start to climb. A cool bed will help you drift off faster and help you stay asleep for longer. While these may not seem like a lot of work, they can do a lot of good when it comes to making you feel more comfortable during the sweltering summer months. Adopting even a few of these ideas can also help you save money on your energy bill each month. If you are in the market for a new air conditioner, please give us a call at Blueox Energy. Our sales staff would love to learn about your home and what your AC needs are. We carry and install a wide range of air conditioners that are perfect for homes and businesses of all sizes. If you need to cool a single room, we have some incredible ductless cooling options available. During the summer, your air conditioner probably feels like the thin line between comfort and torment. 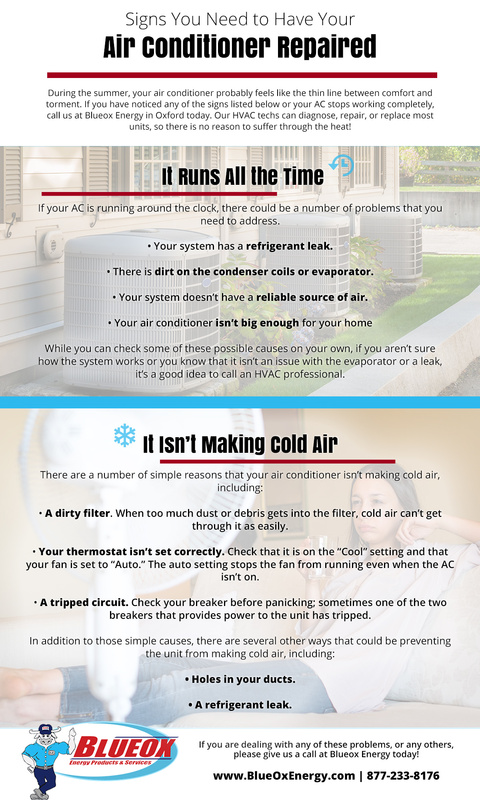 If you have noticed any of the signs listed below or your AC stops working completely, call us at Blueox Energy in Oxford today. Our HVAC techs can diagnose, repair, or replace most units, so there is no reason to suffer through the heat! When you have an HVAC problem or you need a reliable and affordable source of kerosene or fuel oil for your business or home, turn to Blueox Energy. We have supplied the greater-Oxford area with great customer service and excellent prices for decades. Whether you’re in Broome, Tioga, Chenango, Delaware, Otsego, Cortland, or Madison County, one of our convenience stores or service centers is nearby. If your AC is running around the clock, there could be a number of problems that you need to address. While you can check some of these possible causes on your own, if you aren’t sure how the system works or you know that it isn’t an issue with the evaporator or an obvious leak, it’s a good idea to call an HVAC professional. Blueox has cooling experts on staff to help all of our clients with any cooling or heating system problems that may arise. If you aren’t sure if your current system is the right size for your commercial building or home, we can help. A dirty filter. When too much dust or debris gets into the filter, cold air can’t get through it as easily. Your thermostat isn’t set correctly. Check that it is on the “Cool” setting and that your fan is set to “Auto.” The auto setting stops the fan from running even when the AC isn’t on. A tripped circuit. Check your breaker before panicking; sometimes one of the two breakers that provides power to the unit has tripped. If you are dealing with any of these problems, or any others, please give us a call at Blueox Energy today! In addition to offering expert cooling system service and repairs, we also sell and install a wide range of traditional and ductless cooling and heating systems. These ductless units are energy efficient, work great, and are an affordable way to climate control new additions to your home or to make certain rooms or buildings usable all year round. Contact us today for a service call or for a quote on a new central air or ductless heating or cooling system. It’s the only time of year when you actually miss complaining about how cold our NY winters are! It would be our honor to help you enjoy the relief of cool, refreshing air (by installing a central or ductless air conditioning system in your home, mobile home, or small business) because there is nothing more refreshing than a comfortable home after a hot day of work or play. Service or installation of residential central air conditioning systems (for homes with a furnace). Mobile home air conditioning installation and service. Residential ductless air conditioning installation & service (for homes heated by boilers or radiant floors). Central air and ductless air conditioning installation and service for small businesses and light commercial customers. One of the greatest benefits of being a Blueox Energy customer is the ability to deal with a single company for all of your energy needs. From air conditioning to heating services (including fuel delivery! ), it makes your life easier to only have one number to call. Relax and stay cool this summer with Blueox! Call (888) 287-9691 for all of your air conditioning needs.